A real bluesy Christmas number! Compare Elvis's enjoyment in performing this number with similar enjoyment in his own original "Santa Claus Is Back In Town." He clearly enjoyed singing these numbers (and what about D.J. Fontana's opening on the latter?). Then listen to his boredom in numbers such as "Silver Bells" and, would you believe, "Winter Wonderland." No wonder the man had problems! Anyway, This "Merry Christmas Baby" just goes to show what a great Blues singer Elvis could have been (well, WAS, but didn't get enough chance to show it). See also "Reconsider Baby" in this respect. 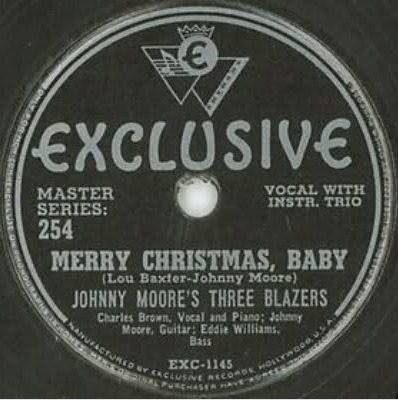 The original version was recorded in 1947 by Johnny Moore's Three Blazers, and featured Charles Brown. It was released on Exclusive, number 254, and reached number 3 on the Billboard R&B chart that Christmas season, charting again in 1948 and 1949.